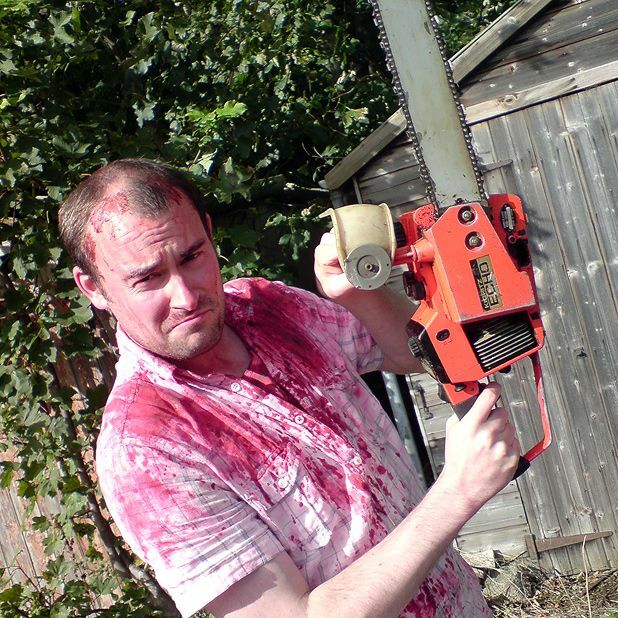 David Keith has been making low-budget horror films in the North East of Scotland for years. His latest is about to get a widescale release in America. Could he be the saviour of Scottish cinema? Martin Howden meets him. For 15 years the North East of Scotland has been awash with soup-eating aliens, demonic killer clowns, poltergeists and OAP zombies. Well, in the mind of a young Aberdeen filmmaker at least. Ever since David Keith won the best short film of the year prize in Empire magazine in 2000 for horror comedy Croutons, Keith has been hard at work making no-budget horror short films. And now he’s completed work on his debut feature, Attack of the Herbals, which is shot around Newtonhill and Johnshaven, and focuses on a small town mistaking Nazi drugs for herbal tea. Despite being made using only the 30-year-old’s life-savings, and featuring a mix of amateur actors, curious locals and his friends, Attack of the Herbals has already snagged a US distributor, and his tea-based horror caused something of a stir when the trailer was shown at this year’s Cannes Film Festival. It’s no surprise the film has already been dubbed the Scottish Shaun of the Dead. While it might not be everyone’s cup of tea, if you liked the Simon Pegg comedy, Peter Jackson’s Braindead and the early works of Sam Raimi and John Carpenter, you’re sure to fall in love with this charming and hugely inventive film debut. So how did a young man obsessed with Van Damme movies and 80s horrors get from there to here? After winning the Empire award more than ten years ago, David divided his time working in a video production company in Aberdeen and making other award-winning short horror films. His late granddad, Jack, who sadly passed away on the day of the wrap party, originally gave him the germ of the idea for Attack of the Herbals. The characters that frequent the small fictional Scottish town called Lobster Cove are certainly memorable. There is a former Olympic marathon athlete dubbed The Road Runner, whose glittering career is ruined after being hit by a drunk driver. Disabled and with a bottle of vodka permanently stuck in his hand, he is also joined by a foul-mouthed boss of the failing lobster plant (played by Aberdeen filmmaker Lee Hutcheon), and the film’s biggest asset, a kilt-wearing tyrant businessman named Bennett – played with remarkable charisma by the film’s co-writer, Liam Matheson. Once the script was finished, David needed a cast, and one that was willing to do it for no money and be happy with the film’s catering, which comprised homemade sandwiches and soup. Camelot Entertainment’s Co-President of distribution, Jessica Kelly, first set eyes on Attack of the Herbals after her assistant ‘came across this zom-com with an amazing storyline’. They then took the film to Cannes, where the trailer received ‘such a great response’. Camelot are now supplying Keith with more budget to bump up the film’s action and horror scenes. With plenty of hype brewing for this Zomedy, Keith’s film aims to put the T in terror and North East filmmaking on the map. Attack of the Herbals is set for release later this year.